We envision an expansive forest landscape for the future that is healthy and resilient to environmental changes, supports strong wildlife and fish populations, produces a sustainable supply of wood and clean water, and is recognized for its contribution to community vitality. The forest ecosystem should clearly be seen for its conservation significance and the value it brings to local communities through access to recreation, clean water, safety from catastrophic fire, and jobs. Containing a significant portion of the Yakima River headwaters and connecting large, intact wilderness areas to the north and south, the Central Cascades Forest knits together an enormous landscape of tremendous conservation value. However, wildfire suppression, intensive timber harvesting, mining and grazing throughout the 20th century have led to dramatic changes in these forests, contributing to increases in wildfire and insect and disease mortality, and amplifying risks to local communities, their water supply, timber production, wildlife habitat, and recreational opportunity. Our efforts to restore long-term forest health in an environmentally safe and economically sound manner will include selective harvest and thinning, tree-planting, brush control, and stream habitat improvement, all guided by the best available science and implemented in collaboration with tribal, public agency, and community partners. For a more detailed look at our conservation goals, click here. The Nature Conservancy’s goal is to restore the forests of the Central Cascades to be more resilient to fire, disease and a changing climate. Active management will be used to develop a healthy and more resilient ecosystem that contains larger trees, more complex and variable habitats, and productive streams flowing with clean water. Active management is expected to include thinning in dense forest stands, logging to create openings and diverse forest structure, prescribed fire and management of forest fuels, planting to build forest diversity, repair of damaging roads and trails, and restoration of stream habitat complexity. For a more detailed look at our FORESTRY goals, click here. There is no fee for recreational access. Hazards exist, however, so recreationists must use caution and enter at their own risk. In particular, the Central Cascades Forest is a working forest with ongoing logging and land management activities that may pose a danger to recreational users. Recreationists must pack out all garbage and follow Leave No Trace practices across the landscape to protect natural resources, fish, and wildlife. For more detail on recreational access, click here. 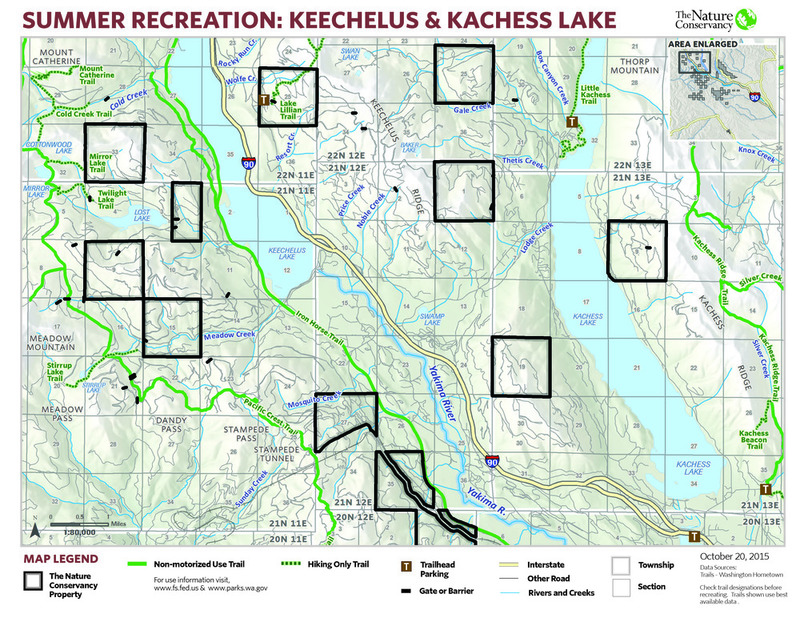 Maps and tables showing authorized summer and winter trails are available here. If you are interested in learning more about these lands or wish to volunteer, please contact Brian Straniti, the Central Cascades Community Coordinator for the Conservancy at brian.straniti@tnc.org or use the form below! The Conservancy has been working with local communities and partners since the acquisition to develop a shared vision for the future of the landscape – a vision that protects nature and supports sustainable recreation. The Conservancy believes that well-managed recreational activities and responsible use can be consistent with the primary objectives of the Central Cascades Forest. i. 73.5 miles of groomed snowmobile trails. These trails are open to non-motorized users as well. ii. 1.4 miles of a groomed dog system that falls within an area that is voluntarily non-motorized. iii. 3.4 miles of groomed cross country ski trails that are open to non-motorized users. Dogs aren’t permitted on these trails. i. 1.8 miles of hiking only trails. ii. 12.6 miles of user-made non-motorized trails on the Cle Elum Ridge, including the popular Rat Pac mountain bike trail. iii. 29.5 miles of single track motorcycle trails. These trails are open to non-motorized users as well. iv. 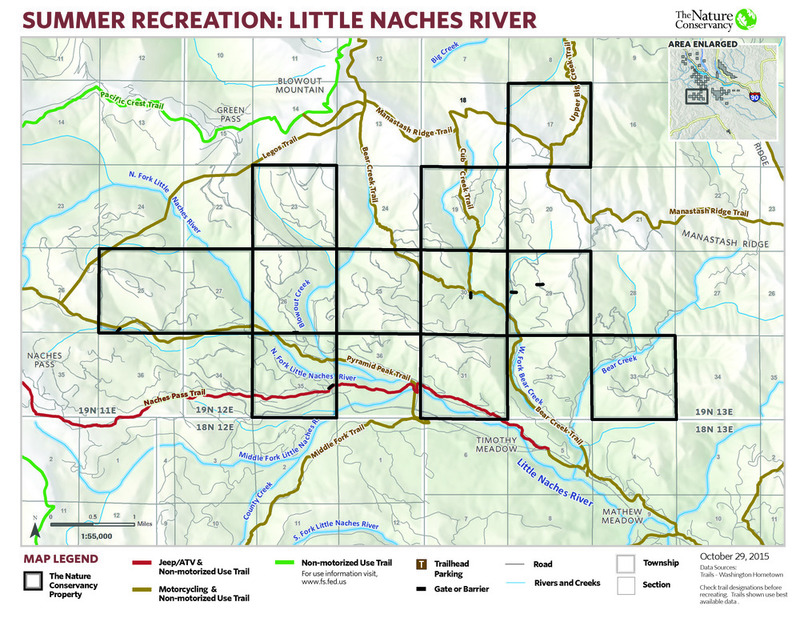 2.2 miles of a regional jeep trail in Little Naches that has historical significance. This trail is open to 4x4's, ATV’s, motorcycles, and non-motorized users as well. It is the only trail or road on Nature Conservancy property that is open to ATV’s. c. Maps and tables showing authorized summer and winter trails are available here. HERE’S AN OUTLINE OF RECREATIONAL USES. Non-motorized use on all lands, throughout the year, unless otherwise posted. The Conservancy encourages non-motorized users to stay on roads and trails unless the activity involves cross country travel such as hunting, collecting forest products, or winter travel with adequate snow cover. Mountain bikes must stay on designated trails and roads to reduce impacts to soil, vegetation, and wildlife. Wheeled motorized use only on open roads and trails authorized for their use. Off-road and off-trail use damages natural resources and disturbs wildlife and is strictly prohibited. Access is prohibited beyond a closed road or trail, even if a gate or sign has been vandalized. Snowmobiles and other over-snow vehicles on groomed trails authorized for their use and cross country with adequate snow cover, unless otherwise posted. Hunting and fishing in accordance with relevant state laws. Dispersed camping, following Leave No Trace parameters, consistent with policies of the Okanogan-Wenatchee National Forest. Campfires in accordance with local and state fire restrictions and in compliance with policies outlined by the Conservancy. By permit only —noncommercial collection of firewood and non-timber forest products like mushrooms or cones. Target shooting and trapping is prohibited year-round. Wheeled motorized use will continue to be prohibited on Cle Elum Ridge.Exceptions to this closure are Forest Service roads 4305, 4305-118 and Forest Service Trail #1340/Sasse Mountain Trail. 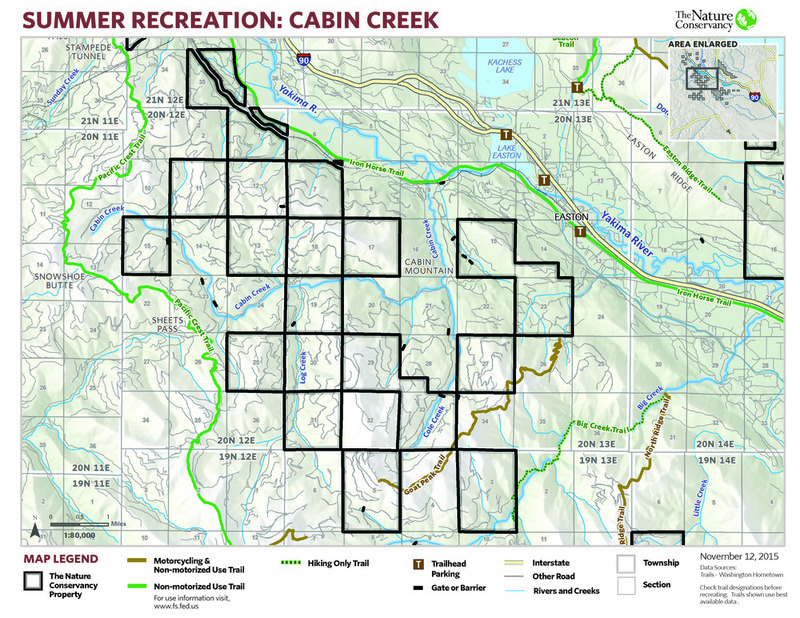 Permanent and semi-permanent camping structures or cabins (e.g., hunting or camping cabins) are prohibited from being constructed within the Central Cascades Forest and if found will be removed. 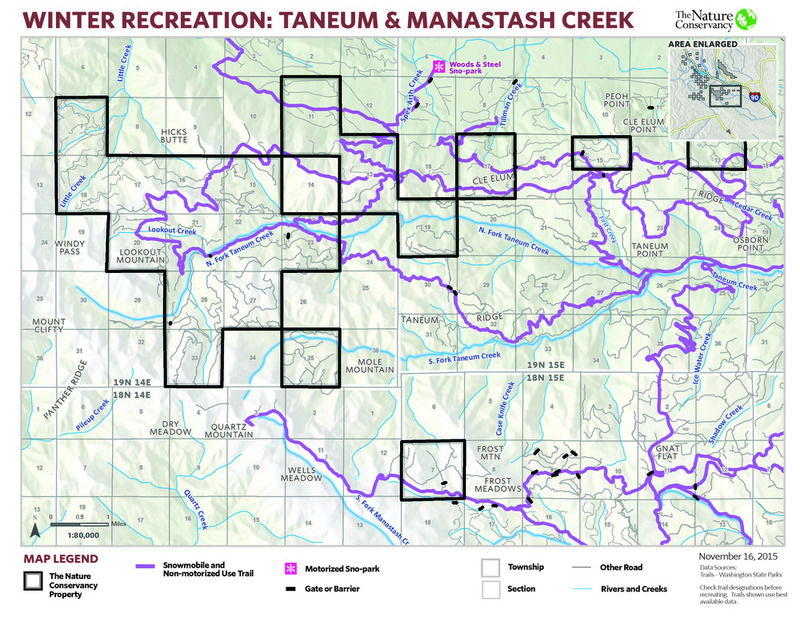 The Nature Conservancy (TNC) allows responsible use of the Central Cascades Forest for public recreation. There is no fee for recreational access. Hazards exist, however, so recreationists must use caution and enter at their own risk. In particular, the Central Cascades Forest is a working forest with ongoing logging and land management activities that may pose a danger to recreational users. Recreationists must pack out all garbage and follow leave no trace practices across the landscape to protect natural resources, fish, and wildlife. 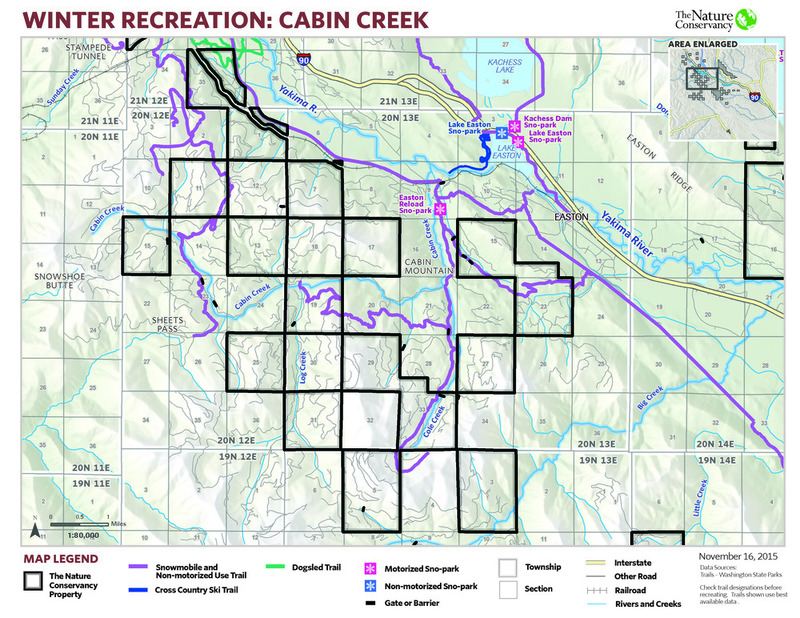 The following policies govern recreation on the Central Cascades Forest and will be strictly enforced in cooperation with the Washington Department of Fish and Wildlife, U.S. Forest Service, and state and local law enforcement agencies. Non-motorized use is permitted on all lands, throughout the year, unless otherwise posted. TNC encourages non-motorized users to stay on roads and trails unless the activity involves cross country travel such as hunting, collecting forest products, or winter travel with adequate snow cover. It is prohibited to cut switchbacks when traveling on an established trail system. Cutting switchback destroys vegetation, ruins the trail, and causes erosion. Mountain bikes must stay on designated trails and roads to reduce impacts to soil, vegetation and wildlife. Wheeled motorized use is permitted only on open roads and trails authorized for their use. Off-road and off-trail use damages the land and is strictly prohibited. To travel on open roads, a vehicle must be street legal according to Washington state law, and the operator must possess a valid driver’s license. Wheeled motorized use will continue to be prohibited on the Cle Elum Ridge (north of I-90). Exceptions to this closure are Forest Service roads 4305, 4305-118 and Forest Service Trail #1340/Sasse Mountain Trail. Off-highway vehicles (OHVs) include motorcycles, all-terrain vehicles, and 4x4s. OHVs are required to stay on open roads and authorized trails that are signed and designated for their use. ATVs are permitted only on the Naches Pass Trail (Forest Service Trail #684). Off-road vehicle trails are closed to all motorized travel in the spring until trail systems are passable. Additional information on opening dates is available at www.fs.fed.us. Access in many areas is controlled through locked gates, berms, or deep ditches (tank traps) to prevent unauthorized use. Closed roads and trails are often posted as such by TNC. However, a closed gate or other closure device without a sign should also be treated as closed to all unauthorized wheeled motorized vehicles. Road and trail restrictions apply even if a sign, gate or closure device has been vandalized or damaged. Gates must not be blocked as administrative, contractor or emergency traffic may need to pass through at any time. Approved spark arrestor to reduce the risk of human-caused wildfires. Muffler that limits sound levels to 105 dBA at 20 inches from the tailpipe and 86 dBA as the OHV passes by 50 feet away. Vehicles are required to be weed-free before traveling off-highway on the Central Cascades Forest. Thoroughly washing OHVs will ensure that seeds are removed and will help mitigate the spread of invasive and noxious weeds. Snowmobiles and other over-snow vehicles are permitted on groomed trails authorized for their use and cross country with adequate snow cover, unless otherwise posted. TNC partners with Washington State Parks to allow grooming for a variety of motorized and non-motorized winter activities. For detailed trail information and other policies visit www.parks.wa.gov. Gates must not be blocked as administrative, contractor or emergency traffic may need to pass through at any time. After consideration of environmental, social, economic and historical values of the Central Cascades Forest, TNC has determined that all existing authorized trails will remain open for public use. This includes motorized and non-motorized groomed winter trail systems managed by Washington State Parks. Wheeled motorized use will continue to be prohibited on the Cle Elum Ridge until the Conservancy has further evaluated the suitability of this area for wheeled motorized recreation and has coordinated with adjacent land owners and other user groups. Exceptions to this are Forest Service Roads 4305, 4305-118 and Forest Service Trail #1340/Sasse Mountain Trail. 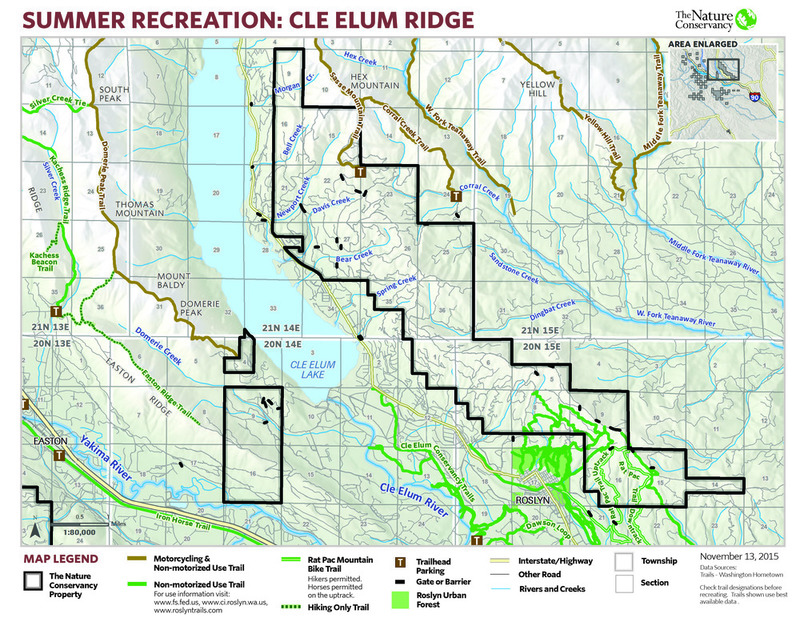 The non-motorized user-made trails shown on the Cle Elum Ridge Summer Trails map will also be assessed with a focus on design, placement and compatibility with different user group. TNC approves use of the popular Rat Pac mountain bike trail and will sign a maintenance agreement with Kittitas County Parks and Recreation District. TNC will routinely assess the suitability of all trails across the landscape. Trails may be relocated to minimize impacts to forest and stream health, wildlife, or conflicts with other forest uses. In cases where trails continue to impact these values, are seen as being in conflict with the management objectives of the property, or create ongoing conflicts with stated recreation policies, they may be permanently closed. In such a case, TNC would notify and directly work with local, state, and federal partners to minimize the impact on responsible recreational users. TNC would also use regular methods to proactively communicate with effected user groups and local communities. Building, relocating or decommissioning roads or trails is strictly prohibited without prior written consent. TNC may agree to the construction of new trails in special circumstances or if an opportunity arises that would support land management objectives and people appropriately using the land. TNC will work closely with local, state, and federal partners to coordinate requests to build new trails that cross property boundaries. If new trails are approved, TNC will promote and look toward partnerships with recreational user groups, state and federal agencies, and volunteers for trail maintenance. As recreation management is not the mission of the organization, and no internal resources or expertise is available to manage a trail maintenance program, TNC will not take on this responsibility. Domesticated animals are allowed for recreational purposes only and must be attended to at all times. The use of certified weed-seed-free livestock hay, forage and bedding is required. Animals should be kept at least 200 feet from water except when watering animals or traveling on established trails. Livestock should not be tied directly to trees because it can cause damage to the trees, plants and soil around them. A high-line should be used instead. Before leaving a campsite, manure should be scattered and the site should be left in as good or better shape than it was found. Grazing is not permitted without a permit and prior approval of a grazing plan. Dogs should be under owner-control at all times. Trail-specific guidelines should be referenced to determine if dogs are allowed or are required to be on a leash. Hunting and fishing is permitted in accordance with relevant state laws managed by the Washington Department of Fish and Wildlife. Additional information can be found on their webpage at www.wdfw.wa.gov. Trapping of game or non-game wildlife is prohibited except with written permission under special circumstances. Target shooting is prohibited year-round on the Central Cascades Forest because of risk to the safety of public recreational users, contractors, and forest managers, potential damage to natural resources, and fire risk. Dispersed camping is permitted in accordance with regulations of the Okanogan-Wenatchee National Forest. Camping is limited to 14 days per site and must not be left unattended for more than 3 consecutive days. Camping beyond 14 days requires relocating to a new site at least 5 miles from the original site. In order to minimize conflicts with wildlife, food, garbage and all other attractants must be acceptably stored at all times. Leave the land as clean or cleaner than you found it and pack out all trash. Additional information is available at www.fs.fed.us. Because the Central Cascades Forest is privately owned and not part of the National Forest system, local and state fire restrictions must be followed. If campfires are permitted, specific use guidelines must be followed. Fires must be extinguished properly by drowning the fire in water and stirring the embers to ensure that everything is wet. Embers should be cool to touch before leaving the fire unattended. Permanent and semi-permanent camping structures or cabins (e.g., hunting or camping cabins) are prohibited from being constructed within the Central Cascades Forest. A written notification will be posted on any structures found by forest managers, contractors, or law enforcement partners and the structure will be removed after 14 days or as soon thereafter as resources become available. Collecting firewood (up to 5 cords of downed wood) for non-commercial purposes is allowed by permit only. TNC staff will provide information on required guidelines, including where firewood can be collected. Vehicles must stay on open roads for wood retrieval. Requests can be made below. Cutting or transplanting Christmas trees is not permitted on the Central Cascades Forest without a permit. Non-profit organizations may request permits subject to forest conditions and TNC’s discretion. Collecting non-timber forest products like mushrooms, cones or berries for non-commercial purposes is allowed by permit only. Requests can be made below. Special events such as bicycle races or tours, running races, poker rides or other organized activity are allowed by permit only. Requests can be made below. Commercial use will be determined on a case-by-case basis and require a negotiated agreement. Contact us with questions or requests. Possessing or discharging fireworks is prohibited year-round. Any use of the Central Cascades Forest not consistent with these regulations shall be considered trespassing and/or any other applicable crime and be prosecuted to the fullest extent of the law. TNC reserves the right to close off access to all or any portions of the Central Cascades Forest, or to require anyone to leave the land, at any time, for any reason. 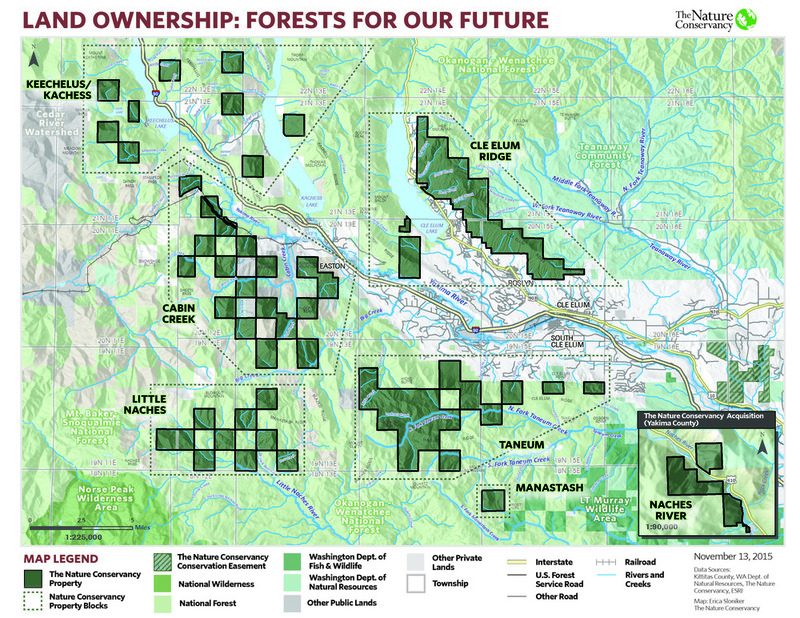 For more information on the Central Cascades Forest including current and future projects, permits, land use and access policies, authorized trails and how to get involved contact TNC’s Central Cascades Community Coordinator, Lara Gricar at lara.gricar@tnc.org. The forest comprises a wide range of forest types, from the moist western hemlock and silver fir forests near the Cascade crest to dry ponderosa pine forests in the eastern foothills and rich riparian forests growing along mountain streams. The majority of these forests are young plantations less than 40 years old. Older forests, greater than 80 years old, are found scattered across almost 20 percent of thearea in riparian areas and other pockets where past harvesting was lighter and more selective. Weaving through this forest environment lies a web like network of 430 miles of road and over 50 miles of trails. To restore the current landscape of dense and young forests active management will be used to develop a healthy and more resilient ecosystem that contains larger trees, more complex and variable habitats, and productive streams flowing with clean water. Active management is expected to include thinning in dense forest stands, logging to create openings and diverse forest structure, prescribed fire and management of forest fuels, planting to build forest diversity, repair of damaging roads and trails, and restoration of stream habitat complexity. The forest management approach follows the principles of ecological forestry as originally developed by Jerry Franklin at the University of Washington and expanded upon by forest ecologists working throughout the Pacific Northwest. Ecological forestry uses the structure, composition, and landscape pattern created by natural disturbances and other forest development processes as guide posts for management. It relies on the basic assumption that natural forest ecosystems provide and sustain the broad array of ecological functions that people currently want from many forests. Widely distributed large, old trees, provide a critical ecological backbone for forested landscapes. The goal is to restore and sustain core ecological functions while also providing for economic benefits and other social goods and services. Working with partners in the Tapash Sustainable Forest Collaborative, The Nature Conservancy’s ecologists and foresters will follow the principles of ecological forestry to develop on-the-ground harvest prescriptions and restoration treatments. The Central Cascades Forest will be managed under a certificate of the Forest Stewardship Council, which ensures that our practices meet an international standard of sustainable forest management. Under agreement with the U.S. 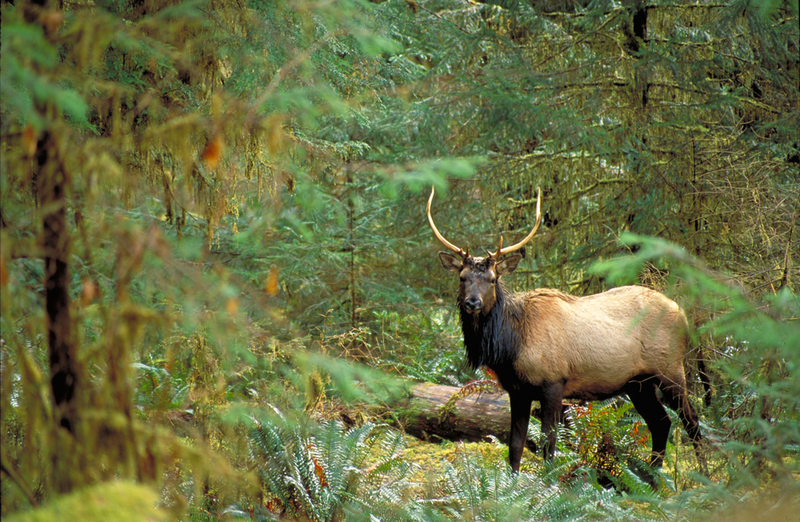 Fish and Wildlife Service and the National Marine Fisheries Service all forest management will also meet or exceed the requirements of a federal Habitat Conservation Plan designed to conserve a suite of threatened or endangered fish and wildlife species. Improve landscape health and resiliency through active management, restoration, and stewardship of forest and stream habitats in a manner consistent with the objectives of the Tapash Sustainable Forest Collaborative and in coordination with landscape partners. Increase habitat suitability and connectivity for fish and wildlife, and improve their ability to respond and adapt to a changing climate. Improve the Upper Yakima Watershed’s ability to store and deliver clean water for fish and wildlife, and downstream municipal and agricultural users. Sequester carbon in growing forests, and reduce carbon emissions through decreasing the risk of uncharacteristically severe fire. Produce income from sustainable forest harvesting to offset costs associated with land management and restoration. Support a locally-sustainable natural resource based economy consisting of forest management and forest products, landscape restoration, and diverse recreation industries. Improve human well-being in neighboring communities by providing outdoor recreational opportunities that are consistent with conservation objectives, reducing the risk of uncharacteristically severe fire, and maintaining access to resources that are important for sustaining tribal cultures. Earn respect as exemplary land stewards from local communities and resource management partners, while also maintaining Forest Stewardship Council certification and Land Trust Accreditation Status. Seek long-term ownership and management solutions for the forest that enhance conservation and community values. A historic land deal that will safeguard clean water, wildlife habitat and outdoor recreation. Located between Snoqualmie Pass and Cle Elum on both sides of I-90, this land is important for people and wildlife alike. The acquisition for conservation marks a major milestone in the ongoing effort to conserve Washington’s natural heritage. Community dialog will create shared vision for these lands. From towering ponderosas to intricate lichen, the land being acquired by The Nature Conservancy is rich, productive and nothing short of gorgeous. Nothing beats seeing it in person, but this slideshow will give you a flavor. 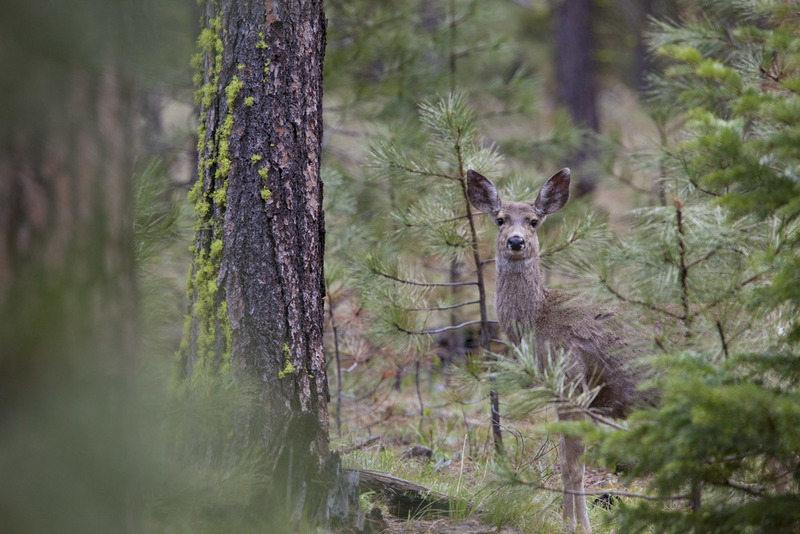 The 47,921 acres of land we are acquiring in the Central Cascades is irreplaceable habitat for wildlife, including elk and bear, as well as rare and threatened species such as wolverine and spotted owl. Touching three lakes and adjacent to the Teanaway Community Forest, this project connects some of the most ecologically diverse forests in the world. The headwaters of the Yakima River are critical for salmon and steelhead. The land is a vital part of the watershed that feeds the Yakima River Valley and its productive farmlands. Where is the land? How do I get to it? The property sits on both sides of I-90 between Snoqualmie Pass and Ellensburg. 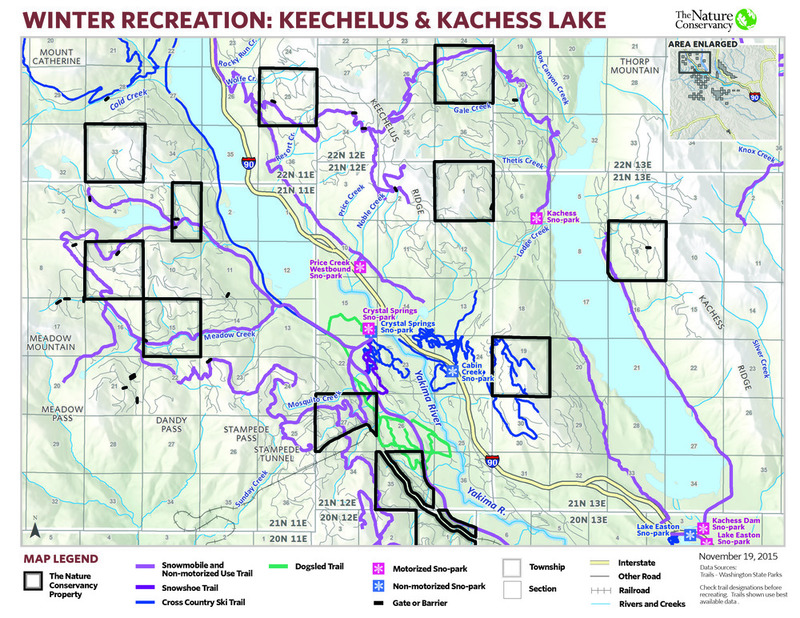 It touches three lakes: Keechelus, Kachess and Cle Elum. It is adjacent to the Teanaway community forest. 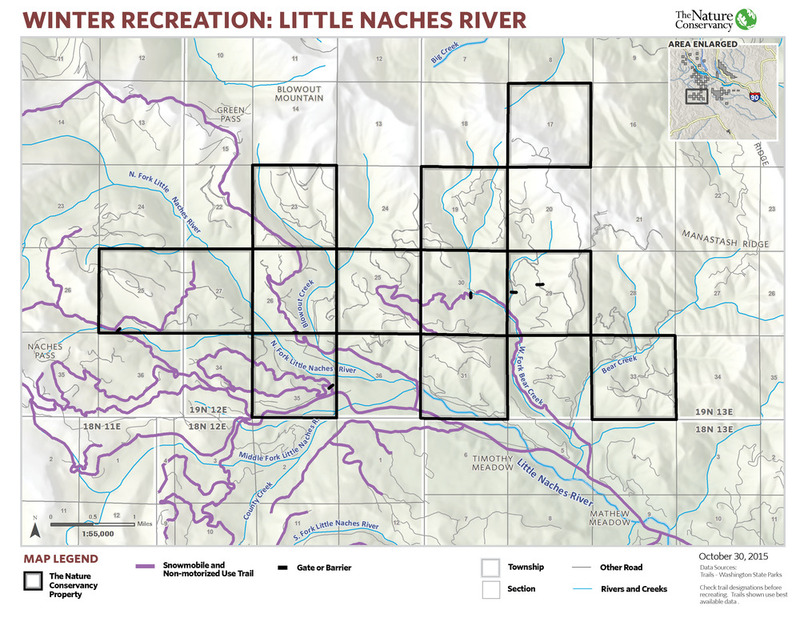 There is also land in the Little Naches headwaters, accessible by highway 410. What does The Nature Conservancy plan to do with this land? Our primary goal in acquiring this land is conservation. We will embark on restoration including commercial and non-commercial forest harvest for long term forest health. We anticipate robust community dialog about the best ways to manage this land for conservation, and restoration, to benefit people and to benefit nature. As we develop the shared vision through our conversation with stakeholders, we will look for opportunities to move some of this land into public ownership where feasible, for long-term conservation. Will these areas remain open to the public? Our intention is to keep the land as open to the public as possible consistent with the conservation purposes for which we purchased this land. We will work to balance recreation and public safety with our primary goal of conservation. As we work to refine recreational access, we’ll continue to provide the same access that is currently allowed. Will individuals be able to have a say in what happens to the land? We look forward to engaging with everyone who has an interest in this land, to develop a shared vision for conserving these lands for people and for nature. Can people help or support this project in any way? Absolutely! We will be reaching out to the local community to engage in a dialog about the future of these lands, and we will identify specific opportunities to support the project. We will also have volunteer stewardship projects on the land after we take ownership. Please check our website for more information. Restoration is expensive so we will definitely need support to restore these forests to health. The Nature Conservancy is a leading conservation organization working around the world to protect the lands and waters on which all life depends.